Is Duterte Playing Hard to Get? Has the Philippines president made a real shift in foreign policy, or is his rhetoric a negotiating tactic? Almost immediately upon taking office in June, President Rodrigo Duterte of the Philippines began fundamentally altering the rhetoric surrounding U.S.-Philippines relations, and this has especially rung true over the course of Duterte’s recent state visit to China. From personal insults to hints of a complete reorientation of his nation’s foreign policy, Duterte’s words appear to have provided an opening – or even an invitation – for Beijing to supplant Washington as the Philippines’ most important patron. 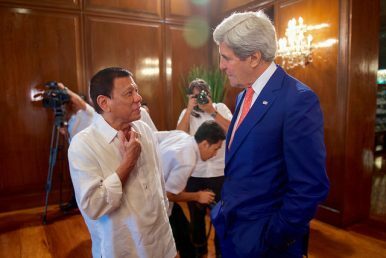 Despite his bluster, however, it is equally likely that Duterte is simply trying to gain more concessions and aid from Washington by showing the United States that it can’t take its relationship with the Philippines for granted. For its part, Beijing sees in Duterte’s anti-U.S. bombast an incredible opportunity to drive a wedge between the United States and its lone treaty ally with claims in the South China Sea. Beijing’s designs on the South China Sea are well-known, and close ties between China and the Philippines (at the expense of the United States) would provide the additional benefit of allowing China to dismantle the perceived containment of the “first island chain,” which has long vexed Chinese military planners. Thus, it came as no surprise when Beijing marked Duterte’s visit with an offer of new financing for Philippine infrastructure (a priority for Duterte), increased cooperation on production capacity, and a lifting of an import embargo and a travel advisory that had both targeted the Philippines. And in keeping with its own views on human rights, Beijing continues to gladly turn a blind eye to the horrific death toll of Duterte’s war on drugs – a particular sore point between Duterte and the United States. All in all, it was exactly the sort of benefit package Duterte was seeking. Duterte was quick to proclaim a “separation from the United States” and that “America has lost,” even going so far as to say that he would “go to Russia and talk to Putin” to put an exclamation point on his pivot away from Washington. Further, Duterte agreed to reestablish bilateral discussions with China over the countries’ claims in the South China Sea for the first time since 2012. The declaration put a ruling on the issue by an international tribunal in The Hague that had found in the Philippines’ favor in the “back seat” and directly contravenes the U.S. position of multilateral talks with all claimants in the region. These certainly seem to be the moves of a leader looking to leave the U.S. orbit in favor of China’s. On the other hand, Duterte’s turning up his nose at the United States doesn’t make complete sense for the president of a nation whose citizens maintain an overwhelmingly positive view of the United States and a much less enthusiastic opinion of China. Indeed, Washington has yet to receive any sort of formal revocation of or requests for changes to the U.S.-Philippines alliance. Duterte may simply be engaging in the time-honored tradition of playing the two biggest powers against each other. Tellingly, he previously announced an end to joint military exercises with the United States one day after U.S. Senator Patrick Leahy suggested that U.S. aid to the Philippines could become conditioned on the reining in of Duterte’s war on drugs. Given what an abrupt course-change allying with Beijing would represent for the Philippines, and the importance the United States accords to its alliance with the Philippines vis-à-vis its interests in the Western Pacific, it’s reasonable to speculate that Duterte’s actual aim is to use ostensibly warmer ties with Beijing as leverage to quiet the human rights criticism coming from Washington and perhaps gain greater economic concessions too. To that end, it’s not unreasonable for the U.S. to match the infrastructure support and other offers of investment made by Beijing to the Philippines – that’s just geopolitics at work – but Washington does not need to ignore Duterte’s policy of extrajudicial killings in his crusade against drug use. In short, Duterte’s actions seem more like a negotiating tactic than a true shift in long-term foreign policy – and if the United States plays its cards right, it can expose Duterte’s maneuvers for what they are: a bold ploy to squeeze a compromise or two out of Washington. Duterte might get a few more investment dollars from the United States here, but there’s not much incentive to go any further than that. Moreover, there’s no doubt that once this situation is resolved, that Washington should heed the lessons learned so that Duterte cannot successfully employ this strategy again. Matthew J. Strabone is an attorney and a partner of the Truman National Security Project. Trying to Solve the Philippines’ South China Sea Conundrum What the US-China Struggle for Regional Dominance Means for Southeast AsiaThe Philippines' Approach to North KoreaA Year Later, the South China Sea Award Stands as Evidence of China's Rule-Breaking BehaviorCan the US Be Reassured by China’s Quiet Compliance With Court Ruling at Scarborough Shoal?